Making my weekly run to Target for some tasty beverages, I encountered this sitting in the back of the lot. 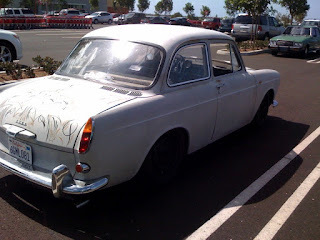 It's a VW Type 3 "Notchback". 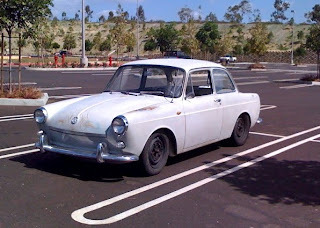 The notchback body style was never offered in the US where VW was afraid of cannibalizing Type 1 "Beetle" sales, this car likely came down from Canada or a serviceman bringing it back from Germany. 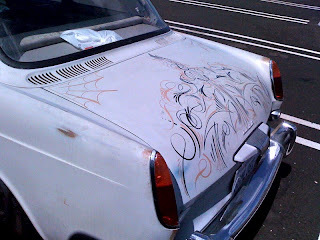 Americans could buy the coupe-like Fastback or the station wagon ("Variant") Squareback though. ...and the "1600" badge on the trunklid indicates that it's a post-1966 car. Not sure how I managed to frame this shot so poorly. But there it is in it's (limited) glory. Still I wouldn't kick it out of the garage. I'd just strip the stripes.